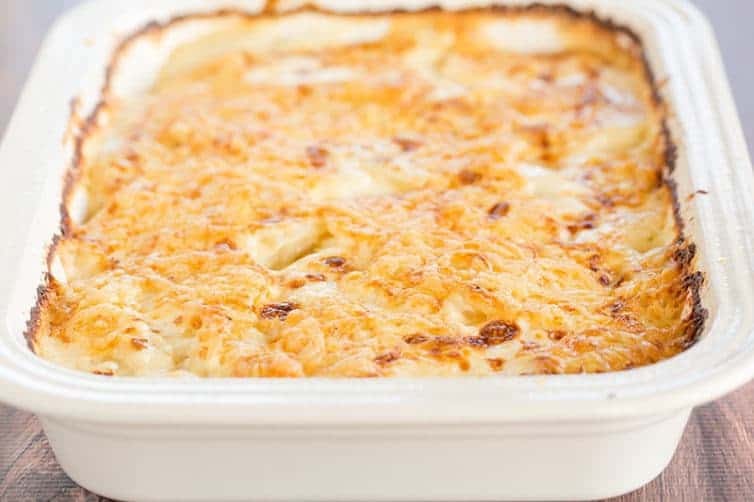 Homemade scalloped potatoes is a classic dish and holiday staple! This easy recipe comes together quickly and is wonderfully rich, creamy and cheesy. Scalloped potatoes are legendary in my family. Back when we would all gather at my grandma’s for Sunday dinner, if a pan of scalloped potatoes showed up on the table, madness ensued. My cousin Kristy and I would go position ourselves at the table based on where the pan of scalloped potatoes was placed. To this day, if we’re at a holiday dinner and there are scalloped potatoes, we take it upon ourselves to sit next to each other and then proceed to put the pan of scalloped potatoes right between us. Back in the day my grandma made hers from a box mix, and they were always delicious, but now I like to make them from scratch. This particular recipe is very holiday-worthy – it’s super creamy and rich, and the pan is demolished is no time. I used to use a mandoline to slice my potatoes up until two weeks ago. Whyyyyyy I never used the slicing blade on my food processor before is seriously beyond me. GAME CHANGER. 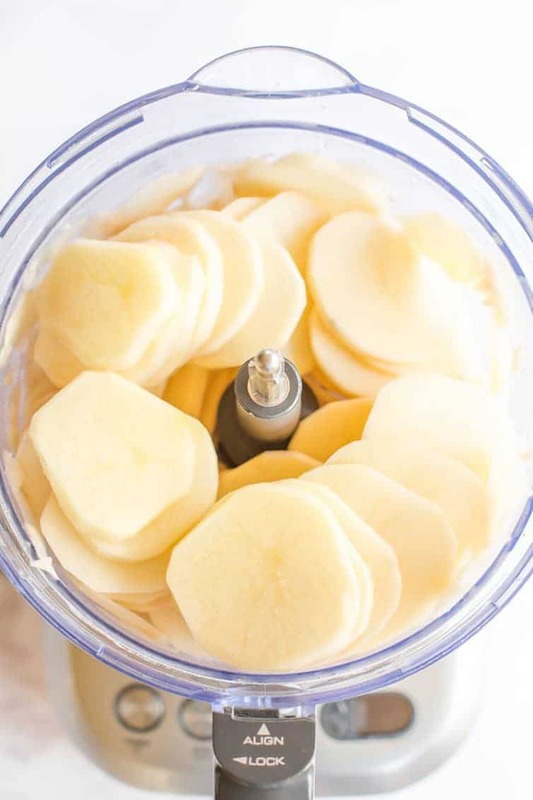 Hello, four pounds of potatoes sliced precisely one-eighth of an inch thick in approximately 1 minute. No exaggeration. I will never slice anything by hand or mandoline again. Now, I first shared this recipe six years ago, and I still love it as my go-to recipe, but I did a little more tweaking this time around. I upped the amount of cheese on top (because bubbly, browned cheese covering the top is an absolute must) and I increased the oven temperature from 350 degrees to 400 degrees. I also increased the baking time from 20 minutes to 30 minutes. The last two changes were made because I found at 350 degrees for 20 minutes the sauce was still a little bit too soupy, but at 400 for 30 minutes, it was thick and bubbling and the resulting dish “set” quite a bit better. The changes are reflected in the recipe below. Is there a traditional dish that people in your family always fight over? I know we’re not alone, ha! 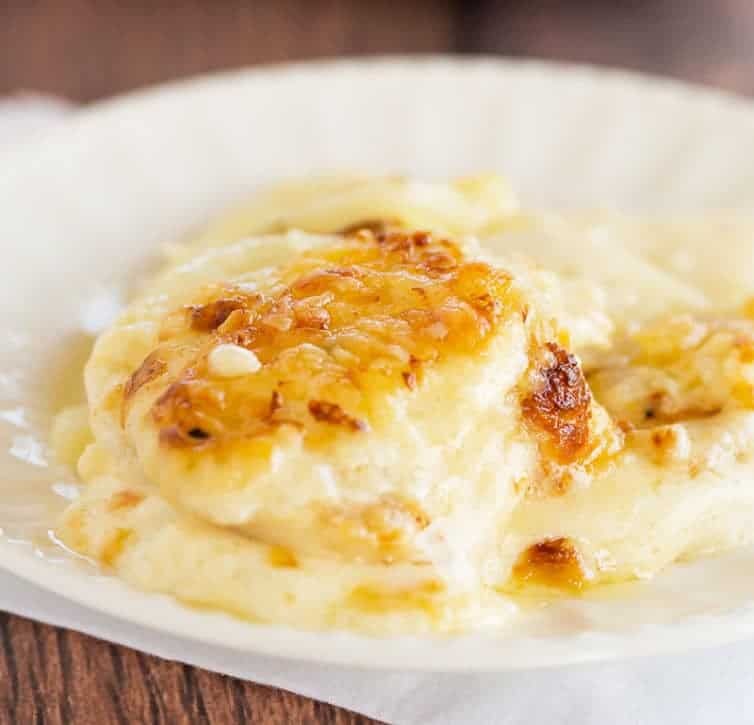 These easy scalloped potatoes come together quickly and are rich and decadent. Meanwhile, melt butter in large Dutch oven (or large, heavy-bottomed saucepan) over medium-high heat until foaming subsides, about 1 minute. Add onion and saute until it turns soft and begins to brown, about 4 minutes. Add garlic and saute until fragrant, about 30 seconds. Add cream, milk, thyme, bay leaves, salt, pepper, and potatoes and bring to a simmer. Cover, adjusting heat as necessary to maintain a light simmer, and cook until potatoes are almost tender (paring knife can be slipped into and out of center of potato slice with some resistance), about 15 minutes, gently stirring occasionally to ensure the potatoes don't stick to the bottom of the pot. Remove and discard thyme sprigs and bay leaves. Transfer potato mixture to a 3-quart baking dish and sprinkle with cheese. Bake until the cream has thickened and is bubbling around sides and the top is golden brown, about 30 minutes. Allow to sit for 10 minutes before serving. 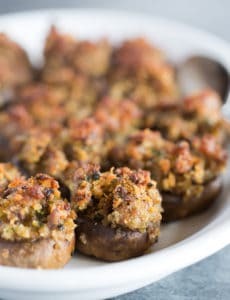 This recipe was originally published on April 20, 2011. These were outstanding! I made these yesterday for Easter and they went over very well! Creamy and flavorful! I followed the recipe exactly as written and it’s perfect! Thank you! can the first part of this recipe be done ahead and put in the fridge to finish off later? I’m wondering the same as above 🙄 thank you. I have made scalloped potatoes from this recipe numerous times over the years and I still think they’re the best I’ve ever made. 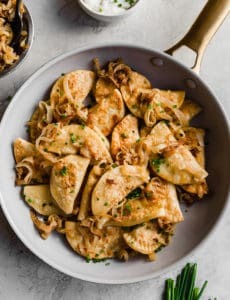 There are two things that contribute to the success of this recipe: the use of russet potatoes and precooking the potatoes on the stove before baking them. Amazing. Thanks for the tip on slicing the potatoes. I’ve never used my Cuisinart like that before, but it was fun. You should add about an hour on the prep time though for the potatoes alone. I used a Dutch oven for the whole thing, so from stove to oven. Delish! 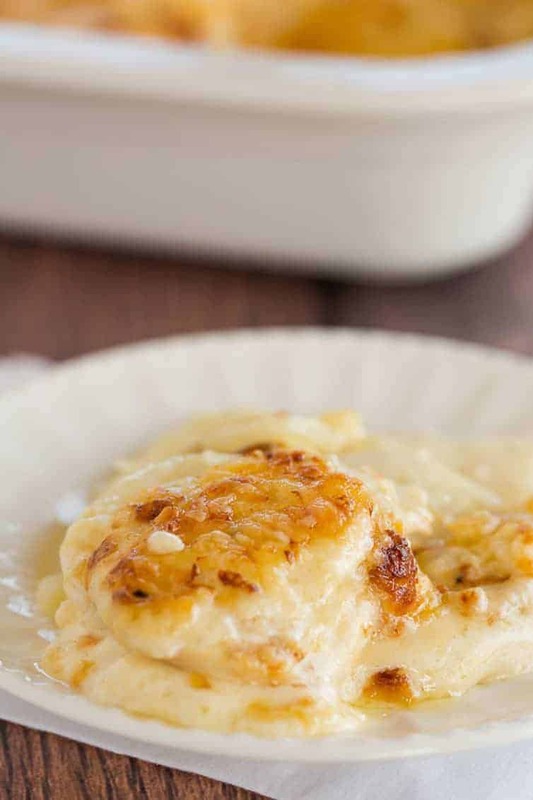 I love these scalloped potatoes! The only change I have made is to leave the potatoes in the Dutch oven and bake according to your instructions. From time-to-time I add diced ham too. 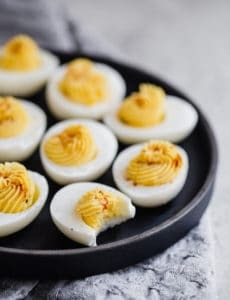 I made this for Easter dinner and it was a big hit! Previously I have had bad luck with scalloped potatoes not being cooked all the way. Not with this recipe…what a great cooking technique. Thanks so much! I made this as a side for Easter dinner. Creamy, cheesy, and delicious. Thanks so much for sharing, Michelle! 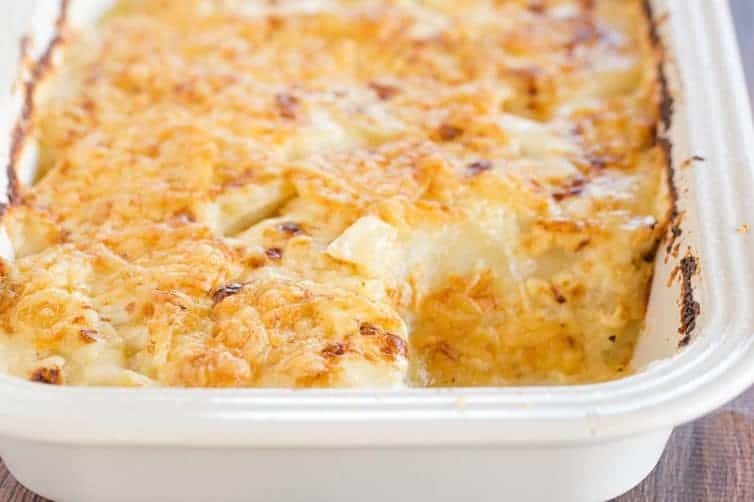 Hi Michelle its time to make your scalloped potatoes for Easter dinner, ever since you posted this recipe I have been making them, it a wonderful recipe and the potatoes cook so nicely, who would have thought to pre-boil them like that! Genius! Blessed Easter to you and yours and hope you are feeling well with that little girl! I think I told you , I had two boys and then got my princess too! I’m so thrilled to hear you love this recipe too, Maria! Thanks so much for taking the time to leave a review, it’s much appreciated! A very Happy Easter to you and your family, and thank you for the kind words, any day now! How long would I put this in the slow cooker for on low? Hi Robyn, I’ve never made it in a slow cooker, but I would try 6 hours maybe? These are Au Gratin Potatoes. Not Scalloped.